With the new launcher (launcher version 1.2.5), it's really easy to decide what version of Minecraft you want to use. Let's say I'm playing on a server that for some reason is still running Minecraft Beta 1.7.3, for that old Minecraft nostalgic feel. In the new launcher, you're going to want to select "New Profile". In this case, we want the "Allow old beta" checked. Normally, you won't want this, but in this random case, you will. Normally, the dropdown will only show release versions; if you want to be allowed to select an older or snapshot version, you will need to check the appropriate box. And if you want to change this version later, you can select "Edit Profile" and change it manually. Note that if you have it set to "use latest version", it will always use the latest release version (or snapshot, if that option is selected). Caution - Notch doesn't want you to do this! To downgrade your Minecraft, get the new launcher (http://minecraft.net/download). Log in with your account on the Log In page, unless you have done so before, where you just choose your account. Now click on New Profile. Go into the section named 'Version Selection'. Here, under Use Version, select the version that you want. Now click Save Profile, and use that profile to log in to the server you want. If you need Minecraft Beta, you must check Allow use of "Beta" Versions. 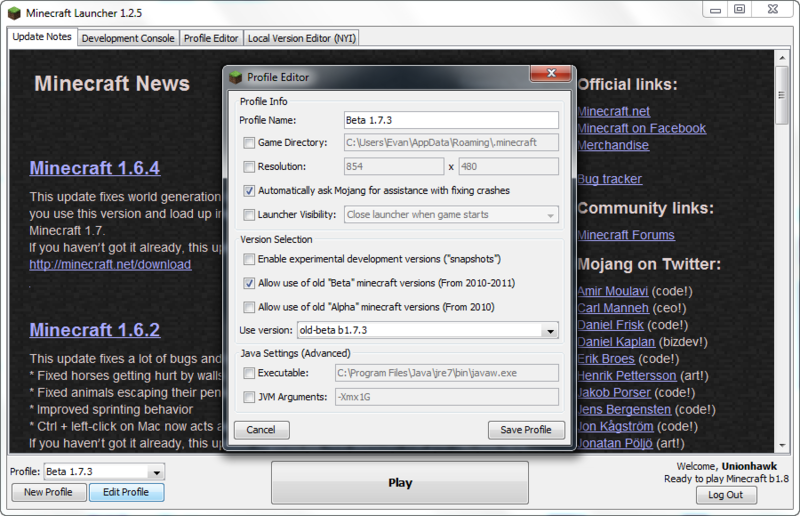 If you need Minecraft Alpha, you must check Allow use of "Alpha" Versions. The answer varies depending on what launcher version you are using. In the latest (when this post was written), you can choose whether or not you wish to update. If so, you press Update, and if not, you press Not Now. If you are using an older launcher version, you would have to get the old minecraft.jar and put it in your .minecraft\bin, wherever that may be. Don't forget to either kill your internet when logging in and play offline, or use your firewall to prevent Minecraft from accessing the internet. The minecraft.jar s can be downloaded from the link below, just change it to whatever version you would like to download. The link below will give you version 1.4.6. If you want a snapshot version, use the second link below. As you can see, that one will give you version 12w50b. Note that as fredley said, Notch disproves of this. How can I run Minecraft 1.6.4 on 1.7.2 client? How do I keep two different versions of Minecraft installed? How do I use a older version of Minecraft to join a server running a newer version of minecraft? How do I put mods on my minecraft server? How can a script check if my local server is running? how do i import bulk terrain/landscape data into a running minecraft server? Can I downgrade my Minecraft Realm from 1.9 to 1.8? Can I rename a version of Minecraft?